Lilyan’s work in psychiatric hospitals, and Lilyan’s own occasional mental health issues, gave Betty a lifelong interest in psychology and mental health issues. The Great Depression was a severe worldwide economic de-pression that started in the United States in about 1929 and lasted until about the beginning of U.S. involvement World War II in 1941. The Great Depression had a devastating effect on all economic classes. During Betty’s childhood personal income and international trade dropped by half to two-thirds. Unemployment rose to 25% and construction essentially stopped. The economy reached its bottom in the winter of 1932-33 and was met with numerous government programs designed to spur economic growth. As a result, families valued frugality. Gift wrap was re-used, string and rubber bands were carefully saved, and, especially for Betty, good food was dearly cherished. This was the cultural and economic climate of Betty’s childhood and it would influence her for the remainder of her life. For Kindergarten Betty attended Howard Roosa in Evansville. Later on in grammar school (today often called elementary school), Betty attended Chestnut-Walnut and Delaware Schools in Evansville. Occasionally when living with her mother in Michigan, Betty would attend school there. Eventually Betty enrolled at F.J. Reitz High School in Evansville’s west side. At some point during her high school career Betty’s family moved to the 3800 block of Bergdolt Road in northern Vanderburgh County, which at the time was within Reitz’s school district. The house was originally built as a summer home, but Betty’s father insulated it so that it would be suitable year-round. It was set far off the road with a large yard for the family to use. Betty recalled that the bus ride to and from school helped form the foundation of her high school friendships, some of which lasted well into adulthood. The rural area fostered a close-knit community. In 1946 she met her future husband, James Frederick Claybourn, at a dance at the Eagle’s Nest in downtown Evansville. Jim had come with another date, and Betty with her father and step-mother. Upon seeing her that evening, Jim told a friend there with him, “I’m going to marry that girl.” At the time Betty was only a junior in high school and Jim was six years her senior. Although her parents had concerns over the difference in age, they decided they had little power to stop it, and so they consented to the couple dating. Betty was “double-promoted” at least twice and was therefore the youngest member of her class when she graduated from Reitz High School in June 1948 at the age of sixteen. She frequently re-ceived academic awards and honor citations throughout her time in school. The following fall, roughly two years after they began dating, Betty and Jim married on 14 October 1948 at Bethlehem Evangelical and Reformed Church (later Bethlehem United Church of Christ). Betty wore a second-hand, white satin gown dress with a scalloped sweetheart neckline and similar scallops at the waist. The bodice was long and tightly fitted and the bouffant skirt extended into a full, sweeping train. The two-tiered veil of illusion was fastened by a tiara of seed pearls and beads. Her bouquet was of white chrysanthemums. Palms, white tapers in fourteen branched candelabra and two aisle baskets filled with white gladioli and chrysanthemums decorated the altar. Immediately following the ceremony a reception was held in the church basement. For their honeymoon the couple traveled to Indianapolis to watch a Reitz football game. This era following the end of World War II brought thousands of young servicemen back to America to pick up their lives and start new families in new homes with new jobs. With unprecedented energy, American industry expanded and Americans began buying goods not available during the war, which created corporate expansion and jobs. Growth was everywhere, and Jim and Betty epitomized this energy and enthusiasm. 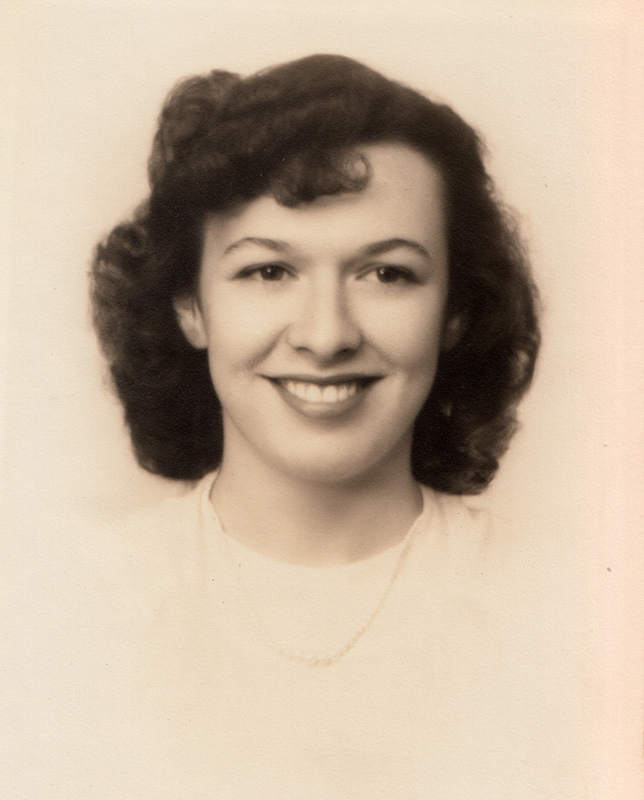 Betty’s first job was in 1948 as a secretary for Evansville attorney Tom Trimble. That same year she left and went to work, until 1952, with the law firm Fine, Hatfield, Sparrenberger & Fine as the personal secretary of Charles Sparrenberger. Isadore Fine founded this firm and his grandson, Marc Fine, would later hire Betty’s grandson, Joshua, in his first job as an attorney. In 1952 the couple gave birth to their first child, James William Claybourn. Two years later in 1954 they gave birth to their second child, Douglas Frederick Claybourn. However, at the time the family was living with Jim’s mother Jennie Mae at 1615 Delmar Avenue in Howell on Evansville’s west side. Betty often remarked that there was no room for two women under one roof and so the young family began looking for a home of their own. Therefore, in early 1955 the family moved to their first home at 3808 Claremont. From 1953 to March 1959, while rearing her family, Betty worked for various offices, on a freelance basis, on temporary assignments while office staff was on vacation, ill, or when they experienced unusually heavy workloads. During this period she worked for a number of local law firms. In March 1959 Betty began working at Mead Johnson in the secretarial pool of the marketing division. Three months later she was promoted to secretary to the Director of Trade Relations. Three months thereafter she was promoted to Executive Secretary reporting to the Executive Vice President in charge of the nutritional/pharmaceutical division. In 1960, while she was still working with Mead Johnson, Betty gave birth to her last child, a daughter named Jennie Lou Claybourn. At that time it was uncommon for a “mother with child” to work in a public office setting once her pregnancy was evident. Her boss, future 8th District Congressman Roger Zion, was ahead of his time in this respect and allowed Betty to continue working well into her pregnancy. After taking some time off when Jennie was young, Betty returned to the workforce. From 1964 to 1970 she worked as an office manager for J.M. Foster Company, an industrial contractor, as it worked on a new Alcoa plant. In 1966, following the death of Jim’s brother, Bill, and sister-in-law, Susie, the family purchased and moved into Bill and Susie’s former home at 2901 Igleheart Avenue. After her children had moved out on their own (and providing rental rooms to college students for several years), Betty moved to a condo in Belle Manor on Evansville’s east side in December 1989 (her first condo was a one bedroom and, in June 1999, she moved to a two bedroom there). Betty lived in Belle Manor for nearly twenty years until moving to assisted living in 2007 and then eventually a nursing home. In December 1978 Betty entered the insurance business and would remain in the field for the rest of her professional career. From 1978 to 1981 she worked for Lincoln National Life Insurance Company as an office manager and executive secretary. But later in about 1982 she gained her license and actually began selling insurance for Met Life. She remained working with Met Life in some capacity until cutting back and eventually retiring around 2005. Betty was very active in professional secretary organizations during her legal office career. After becoming a member of St Paul’s Lutheran Church she helped organize and facilitate a group for single adults, called the Helpmates. The group received several write-ups in local newspapers and was an important ministry to Christian singles in Evansville. She later helped begin St. Paul’s seniors’ group which she named The Encouragers. She was the driving force in the group until health problems triggered by a broken hip in July 2007 forced her to hand over the reins to others. During her twilight years a longtime family friend, George Kitzinger, was Betty’s constant companion. George also knew Betty’s first husband, Jim, through various community activities, particularly softball leagues. George faithfully looked after Betty as she struggled with dementia or Alzheimer’s in the final years of her life. What began as occasional forgetfulness eventually morphed into a virtual complete loss of basic memory. These twilight years were spent in various nursing homes, but through it all she had the regular and faithful support and visits from family – especially her three children – and her friend, George. He died on 5 July 2015. Betty passed away peacefully in Evansville on 12 April 2016 surrounded by her family. Betty has eight surviving grandchildren, J.P. Claybourn (Katie), Brian Claybourn (Keri), Josh Claybourn (Allyson), Kelli Zabel (Tony), Cole Claybourn, Betsy Kohut, Jamie Brewer (Josh) and Matt Jackson; and seven surviving great-grandchildren, Parker Claybourn, Prudence Claybourn, Rowan Zabel, Louisa Zabel, Mary Grace Zabel, Lilyana Claire Trinoskey and Violet Brewer. Betty was preceded in death by her parents; the father of her children, Jim Claybourn; and her brother, Billy Morrow. Funeral services will be held at 11 a.m. Friday, 15 April 2016, at St. Paul’s Lutheran Church, 100 E. Michigan St., Evansville, IN, 47711, with Pastors Matthew Schilling and Chad Eckels officiating. Burial will follow at Sunset Memorial Park Cemetery. Friends may visit from 2 until 8 p.m. Thursday, 14 April 2016, at Browning Funeral Home, 738 E. Diamond Ave., Evansville, IN, 47711, and again from 10 a.m. until time of service Friday at the church. In lieu of flowers, memorial contributions may be made to Evansville Lutheran School, 120 E. Michigan St., Evansville, IN 47711, to St. Paul’s Lutheran Church, or to the Alzheimer’s Association, 701 N Weinbach Ave #510, Evansville, IN 47711.